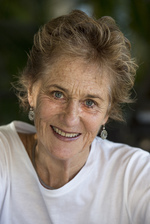 Kate Reid was born in Bowral, NSW, in 1948 and began piano studies at the age of seven. Subsequently she studied under Norma Williams, Donald Hollier, Albert Landa and Ronald Farren-Price, all of whom made substantial contributions to her creative development. On leaving school, Reid studied piano in Paris under Mme Bascouret de Gueraldi of the Ecole Normale before returning home to complete a BA at Sydney University where she studied composition with Peter Sculthorpe and Eric Gross. Shortly after, Reid married and raised a family in Southern NSW, where her aesthetic sensibility was formed by the sights and sounds of the Australian bush. In 1977 she returned to Sydney to embark upon an acting career and this new direction provided opportunities to write music for theatre, cabaret, film, television and radio. An accomplished pianist, Reid has performed her own compositions at concert venues in Australia, Ireland, and Croatia. Her music has been performed and recorded in France, Korea and Australia. She has worked as Musical Director, arranger and pianist at the Sydney Writers' Festival, the Sydney Theatre Company and in various venues throughout NSW. She co-founded The Madrigirls, a six-part all-female a cappella group, which performed in the Sydney Opera House Studio and Belvoir St Theatre. She has also had piano pieces performed in Suzuki concerts at the Sydney Opera House. Since the mid-1980s Reid's love of composing has taken precedence over her acting career. As well as writing incidental music for theatre and film, she has composed for solo piano, voice, small ensembles and orchestra. She has collaborated with director Rodney Fisher AOM and author Morris Gleitzman on the children's musical, Give Peas a Chance. In 2007 the Riverside Theatre Parramatta commissioned her to set to music Robert Browning's poem, The Pied Piper. Other commissions have included music for the Australian War Memorial's touring exhibition The Spirit of Anzac and the score for Andrew Furphy's 2013 film Child Lost on Goolumbulla. The works that best represent Reid's style include Elvira, a sextet for violins, piano and double bass, performed at the Sydney Conservatorium in 2013, and two songs for soprano and piano, A Child's Odyssey (words by Alison Marshall) and Empty Rooms (words by Rodney Fisher), also performed at the Sydney Conservatorium in 2015. Reid cites contemporary Australian composers Carl Vine, Matthew Hindson, Paul Stanhope and Clare Maclean as significant influences. In June 2017 she completed her Master's in Music (Composition) under the supervision of Paul Stanhope at the Conservatorium of Music in Sydney. Later that year she spent a month doing a residency at the Composers' School in Visby, on the island of Gotland in Sweden.